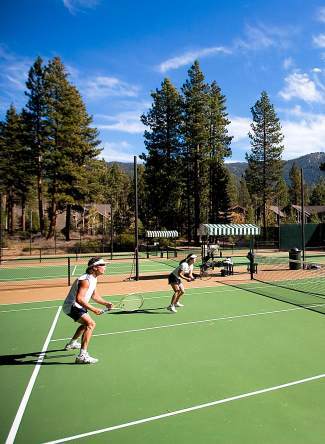 Register for various events at the Incline Tennis Center to improve your game, stay in shape, and have some fun. Feels like summer is winding down at the lake but the Incline Tennis Center is still in full swing! For tennis fans the US Open is the last grand slam of the year and we all wait in anticipation to see who will win this grueling event. Workouts: Take yoga, Pilates, Zumba®, spinning, TRX or lift weights. Cardio tennis classes are also a great way to get a good workout and are offered Wednesdays at noon at the Incline Tennis Center. Stretch before playing and after: Use stretch bands to warm up your shoulders and arms. Play USTA league matches and tournaments: If you want to improve your mental focus and strategies the best way to do that is to play in a tournament. The extra pressure makes some people nervous, but be patient with yourself and have fun and you will improve. Take clinics or lessons: It may take some extra effort but with better strokes and understanding of strategies you will play better and have more fun! Use a ball machine: This helps you to practice and improve the consistency of your stroke. Practice in a fun and friendly format like mixers or round robins: Social matches can help you work on a few new things without worrying about having to win. In honor of the US Open, the Incline Tennis Center is holding a Zodiac Mixer, a doubles social tournament, on Sunday Aug 31 and a Ladies Camp September 2-4. Visit InclineTennis.com or call 775-832-1235 for more information. “Tip of the week” is a weekly feature running in the North Lake Tahoe Bonanza, in partnership with the Incline Village General Improvement District, providing locals with various tips pertaining to the recreation opportunities and services the district provides. This tip was provided by Serena Quarelli, Director of Tennis at the Incline Tennis Center.